Turnip? Rutabaga? Whatever, just turn it into dinner. Sunday was our first wedding anniversary. Time flies – that’s now two years of togetherness, though Nick says he’s sure it must have been longer. Nope. Two years, almost to the day, and one year of marriedness, and we spent our anniversary in much the same way we’ve spent most of our days – almost completely out of money more than a week before payday, in the rain, with some of our favourite people. We went to The Glen at Maple Falls this weekend, which is somewhere near Mount Baker in Washington, and spent three rainy days with a few good friends. The food was fatty, the beer was cheap, and for some reason we all got a little too caught up in the figure skating championships on TV. I blame the cheap American dairy, which was delicious, for the glassy-eyed stupor that befell us all. I ate a pint of ice cream from the dairy on the way down. There must be something magical about American cattle, because we don’t have ice cream like that up here. Egg nog swirl? GENIUS. Maybe the grass is actually greener down south? Could be. Anyway, last night was our anniversary, and I had intended to turn the turnip into something magical, but Paul’s car had a little bit of trouble on the way home, and, long story short, we ended up pushing it across the border. Canadians really are very nice, and we were grateful for our good-humoured border guard. And as we waited for the tow truck, and then Paul’s sister, and then the SkyTrain ride home, what was going to be an elaborate meal got shelved for an easy bit of soup instead. Until tonight. Tonight. Chelsea came over, and then Paul, and then we celebrated appropriately – with butter and beer and wine and cheese and this little turnip thing that’s actually kind of a big deal. I’m going to give you the recipe, but keep in mind that it makes a lot of pasta and I ended up freezing half. Double the sauce recipe if you’re feeding eight, and boil the full amount of gnocchi. If you make the full batch of pasta and you’re only feeding four, you’ll end up with too much to eat, even for lunches the next day. 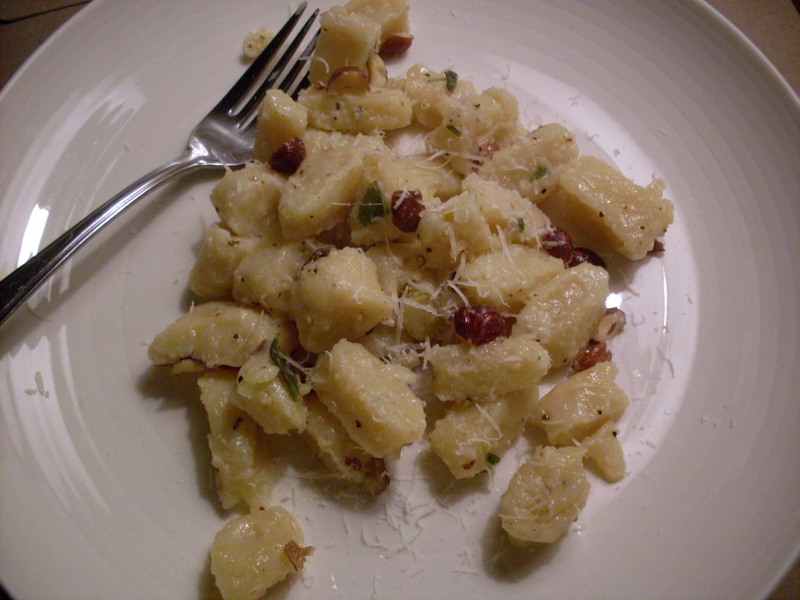 You can freeze uncooked gnocchi for up to one month – you’ll certainly use it before that. Halve the recipe if you’ve got a smaller turnip (you’ll need a bit more flour because you can’t halve an egg, so adjust as needed), and keep the sauce the same. I used a food processor, but that’s because it’s Monday night, and at 7:00 pm you just don’t have all day. You don’t have to – if you don’t, though, this might be a recipe better suited to a weekend when you have a bit more time. Thoroughly combine turnip, crème fraîche, egg, and spices in a large bowl. Gradually stir in flour until dough is formed. Sprinkle reserved flour on a large surface. Cut dough in half, and form each half into baseball-sized pieces. Roll each piece until it’s about one half-inch in diameter. Slice half-inch chunks, dropping slices onto a cookie sheet until you’re ready to drop the lot into a pot of boiling water. As mentioned, I only used half of this, and froze the rest. But that’s because I only ever have to feed four people. 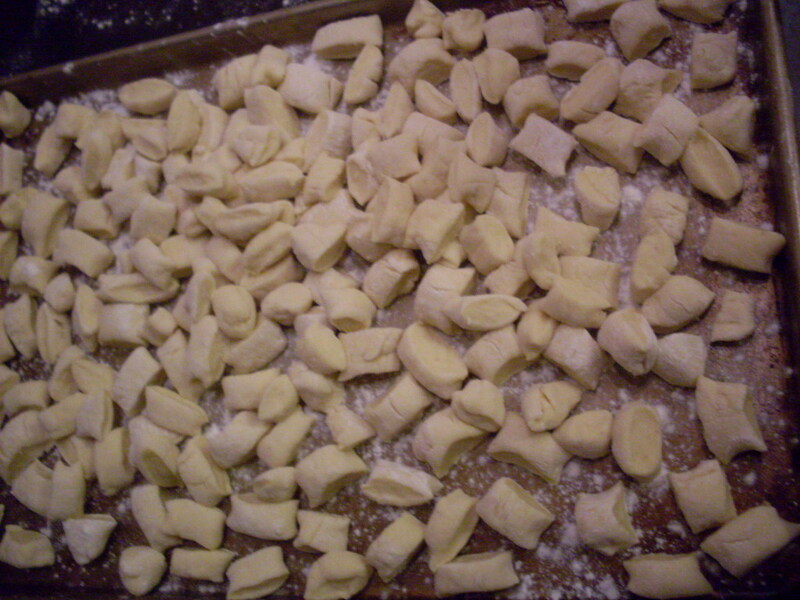 Boil for eight to ten minutes, in salted water, until gnocchi rise to the top. In a large pan, melt the butter, and add the uncooked garlic, until you can just smell the buttery garlickness, until the garlic is just slightly golden. 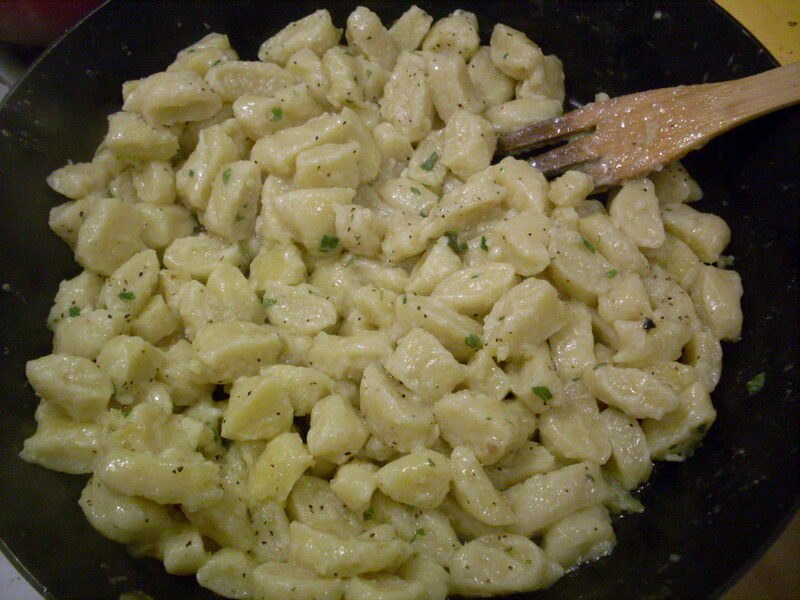 Squish in your roasted garlic, and add your gnocchi. Toss to coat. 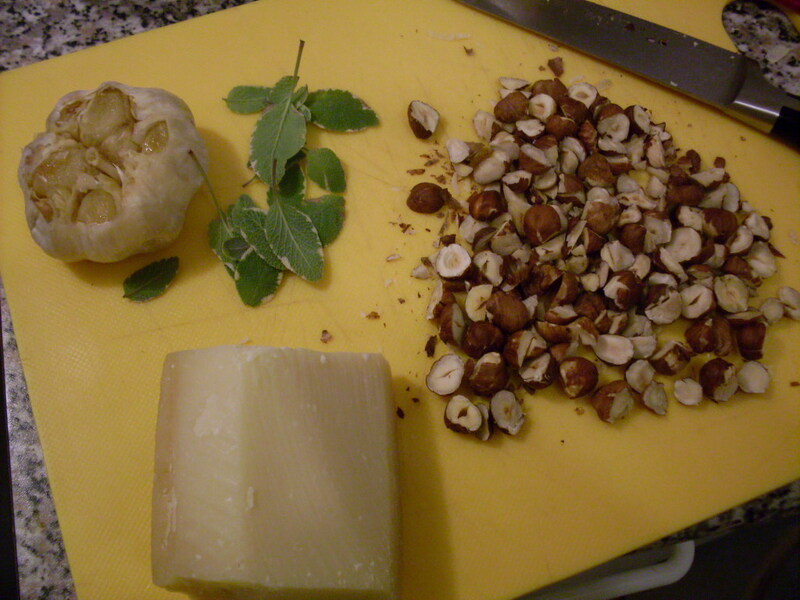 Let simmer for two to three minutes, then toss with sage and hazelnuts. Let sit for another minute. Grate a bit of cheese over top, and season to taste. 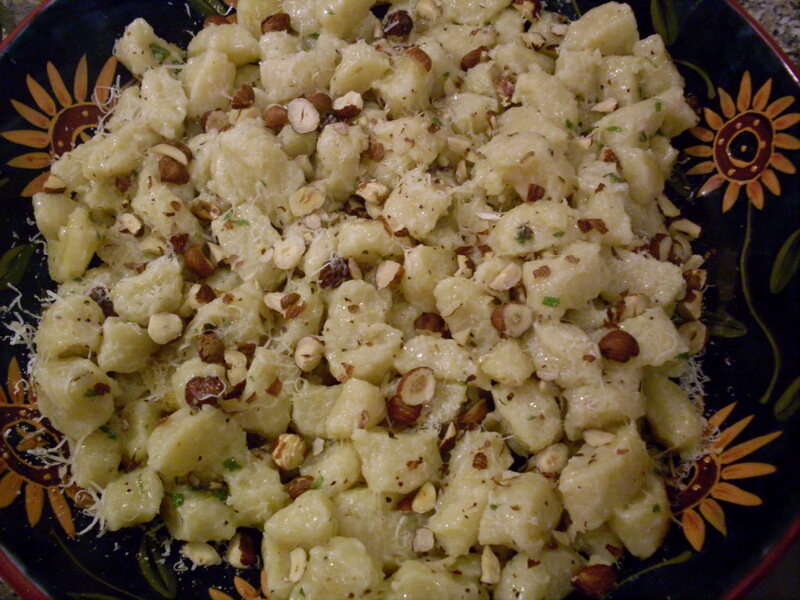 Grate a little bit more cheese over top and sprinkle a bit of nutmeg over before serving. This ends up being quite an inexpensive, very filling feast, one that’s redolent of autumn warmth, especially now that it’s starting to feel a lot like winter. Perfect for an anniversary, or even the day after, with your favourite person or a few of them. Just enough turnip, more than enough but not too much garlic, and butter. You don’t need anything more, except maybe a dollop of that crème fraîche and a little bit of good wine. There’s no reason why you can’t make gnocchi with any starchy, earthy thing you have on hand, and there’s no reason why you can’t make your own adventure when stranded a couple of hours from home. Both are the kind of thing you’ll surely talk about for a long while afterward. < Previous When it’s rainy and windy and there are boxes everywhere and if you live in Vancouver, go to The Three Lions Café. Next > Cranberry scones, and good morning to you! Pingback: Beer for a Year, month seven… | WHO EATS LIKE THIS?….